Noiseless Chatter advisory: Please give a warm welcome to our first guest author! Dave, of Dave Wrote This, wrote this. 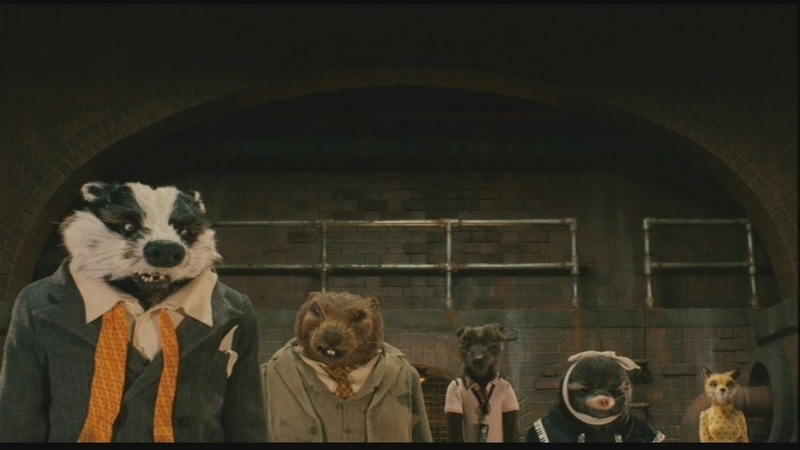 He offered to write a defense of Fantastic Mr. Fox and I took him up on that immediately, because that was pretty much going to be the only Anderson film that wasn’t getting much attention during Wes Anderson Month. So thanks, Dave…and I hope everybody enjoys reading it. Spelling his and British. For some reason Phil has a willful blind spot in the shape of Fantastic Mr. Fox. His spoiler review of Moonrise Kingdom (so far) reads: “It’s better than Fantastic Mr. Fox. Because come on.” Phil has set himself up for potential (and possibly well deserved) disappointment. 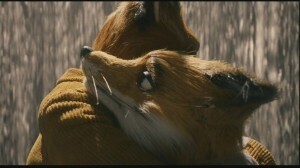 I think Fantastic Mr. Fox has suffered unjustly at his hands. I’m hoping to redress the balance here. Roald Dahl was apparently not a fan of the film adaptations of his books. He felt that the 1971 film version of Charlie And The Chocolate Factory, focused too much on Willy Wonka (as indeed the name change to Willy Wonka And The Chocolate Factory would suggest). The film also departed from the source material with the addition of a plot thread of the children spying for Slugworth and the scene of Charlie and Grandpa Joe belching their way to safety. He later described the 1990 film version of The Witches as “utterly appalling”. It’s not clear whether Dahl simply resented the liberties taken by filmmakers with his original material or if he actually hated the films themselves. When Danny DeVito was promoting Matilda, he was repeatedly asked in British TV interviews whether the late Dahl would have approved of his film. The answer he gave, and to be fair pretty much the only answer he could give in the circumstances was something along the lines of “I hope so”. What does this have to do with Wes Anderson? After the success of his first five films it’s interesting that an auteur filmmaker as clearly obsessive as Anderson would choose to film an adaptation at all. Therefore whatever his choice of material it would always be a significant one. That he would choose Dahl is interesting. That he would choose Fantastic Mr. Fox is surprising. That he would choose animation is fascinating. That he would choose stop-motion animation is very revealing. 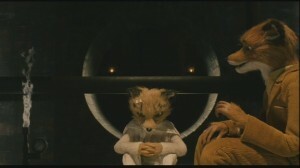 Phil’s primer describes Fantastic Mr. Fox as a “curious expansion on a minor Roald Dahl story” and again I disagree. Firstly, there are no minor Roald Dahl stories. Secondly, I thought the story was very well expanded. Did I go back and re-read the original book, compare and contrast the content and then weigh up each decision that was made? No, I just thought the story on screen was better than I remembered it. I know it’s not quantifiable, but it does mean that even without the rose-tinted spectacles of nostalgia this film has achieved what must surely be best outcome for an adaptation: it’s an improvement on the original. Turn the concept of this expansion on its head, Roald Dahl’s novelisation of Rushmore (with illustrations by Quentin Blake obviously) would be a simple, yet pithy, cautionary tale which would swap Anderson’s montages for a stark list and there would be far less Serpico. The story would survive this, but the subtlety of Anderson’s storytelling would not. The flavours would obviously be different. Ash: What’s that white stuff around his mouth? Kylie: I think he eats soap. Mr. Fox: That’s not soap. 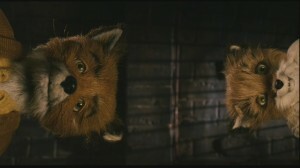 Mr. Fox: He’s rabid. With rabies. In previous films, Anderson has used his live action actors like talking props and at other times like puppets. I disagree that the subtlety this affords him in live action doesn’t transfer to his animation, but I will concede that the emphasis is different. 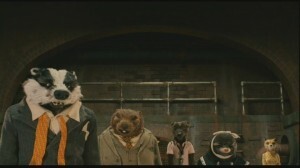 Anderson recorded this film’s dialogue on location rather than get ‘perfect’ takes in a studio, which gives the vocals a distracted quality that echoes the feel of his live action films. The musical soundtrack is very Anderson, featuring the likes of The Beach Boys, Art Tatum and in particular the use of ‘Street Fighting Man’ by the Rolling Stones. Although, any film that features an animated Jarvis Cocker singing is probably going to be alright by me. Petey: Erm… I just kind of made it up as I went along, really. Franklin Bean: That’s just weak songwriting! 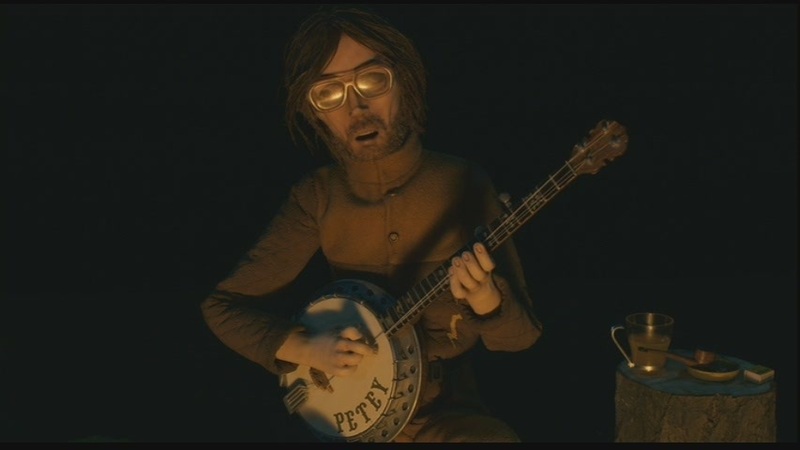 You wrote a bad song, Petey! The other “obtrusive hallmarks” that make a Wes Anderson film into ‘a Wes Anderson film’ are all present and correct in Fantastic Mr. Fox. The onscreen captions, the family dysfunction, the colour palette, the insert shots to exploit exposition and the moments of stillness are all there. None of which is particularly Dahl. None of which matters. I think it’s safe to say that Dahl would probably never have enjoyed a film based on his work, but I think even he would respect the care and attention that went into this. For me, Fantastic Mr. Fox sits favourably alongside the rest of Wes Anderson’s work. His biggest achievement with this film is that without obviously compromising he has successfully made both a Wes Anderson film and a Roald Dahl adaptation that the author might not have hated. Rather than assuming Moonrise Kingdom has to be better than Fantastic Mr. Fox, maybe Phil should be hoping that it’s nearly as good.